The way home inspections should be conducted! What is the All Pro Home Inspection Seller Advantage Program? An All Pro Home Inspection Seller Advantage Program is a home inspection that is performed before the house goes on the market, or in a few cases the inspection has been completed shortly after a home has been listed to assist in the marketability of the home. The benefits of this program will create a powerful marketing tool that can be used during the process of selling your home. All Pro Home Inspection performs pre-listing inspections, as do many other companies, but All Pro Home Inspection does things a little differently. Let us help you get that SOLD sign up! How will the All Pro Home Inspection Seller Advantage Program Benefit the Seller? You resolve any differences of opinion about the home before it goes on the market. Most if not all homes have room for improvement. Disclosing the condition of the home allows you to reflect the condition in the listing price, rather than have to negotiate again later when the issues are discovered. There has been some BIG changes to the program. 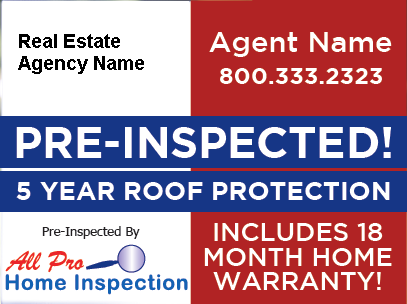 First, every home that is pre-inspected will have a 5-Yr Roof Protection Plan that is transferable to the buyer. Next, because All Pro Home Inspection has completed home inspection the home is eligible to have an 18 Month Home Warranty. That’s 6 extra months of coverage for FREE! The seller has two options with regards to a home warranty. Purchase and provide the warranty for the buyer. If this is the case the seller would gain the benefits of having a warranty (listing coverage) in place at no additional cost. The listing coverage is for a period of 120 days. If for some reason the seller doesn’t wish to provide value to the deal in the form of this 18 month warranty there would not be any listing coverage provided to the seller. However, the buyer would have the opportunity to purchase the warranty at closing and gain the protection of the 18 Month Home Warranty. I can not stress the importance of the seller purchasing the warranty and gaining the listing coverage and gaining and providing peace of mind. Don’t be afraid in making an investment to achieve your goal of selling your home, the first time and the right way! This program is a wonderful and powerful way of selling your home. Once people see and understand the All Pro Home Inspection Seller Advantage Program it becomes a necessity. After all, your goal as a seller is to sell your home quickly, without problems, and for the top dollar it can bring in the marketplace. So why not utilize every tool available to achieve success? Due to the nature of this program, the information provided on this site is limited. We have put together a powerful program for the seller and we don’t want our competitors to take any credit … at least not yet! If you or your Realtor® would like to schedule an appointment to learn more about this program or to schedule your inspection. Let us help you succeed in selling your home on your terms.